in the Bay of Plenty, New Zealand. Yesterday we drove from Napier to Gisborne then to Whakatane. Our journey took us through beautiful lush native forest with abundant tree ferns, rolling farmland, and along pristine coastline. As we neared Whakatane, we caught a glimpse of White Island, with a wisp of steam rising up from its centre like an exclamation mark. That's our mission for tomorrow - a visit to an active marine volcano! We checked into the White Island Rendezvous and soon after receive the details of our tour the next day. The White Island boat tours (PeeJay Tours) are owned and operated by the same folk who own the White Island Rendezvous accommodation which also doubles as the base and departure point for the tours. So today is volcano day - we checked in at 9am and receive the details of the tour and our boarding passes. The boat journey out to the island takes about an hour and a half but soon after our captain has navigated the Whakatane River Mouth and set a course out to White Island we come across a pod of playful Common Dolphins and spend some time enjoying their company. Time to continue on with the journey and soon the island becomes the main focus of our attention as it looms closer and larger with every second. The island is privately owned by the Buttle Family (3 generations) and only permit holders are allowed access to the island. The owners of White Island Tours have been assigned as guardians of the island and are one of the few permit holders. As we reach the shores of the island, we first see an Australasian Gannet colony of between 8,000 to 10,000 birds - adventurous bunch to nest on an active volcano!! The captain soon pulls the vessel PeeJay V into Crater Bay and sets the anchor. From here all passengers are ferried to shore by way of small inflatable and dropped off at a small dock left over from the mining days of the early 1900's. Once off loaded from the inflatable, passengers scramble over a few large boulders and finally gather in groups on the beach and await our guides. After a briefing by our tour guide to explain emergency procedures, we set off adorned in hard hats and gas masks and armed with camera's. 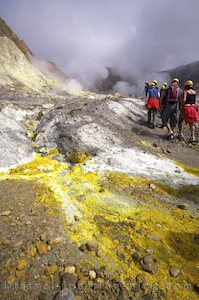 Our first introduction to the power of this volcano was a constantly and fiercely steaming fumarole emitting hot sulfurous gases which tickled everyone's throats and called for the immediate use of our gas masks. Also for this our guides handed out sweets to sooth the tickle. The whole island is covered in loose rocks and fine ash and at this time of year (summer) is extremely dry. Prior to the eruption in July 2000, the whole island was covered in only fine ash, however the last violent eruption left a covering of sharp rocks both large and small. It was quite an awe inspiring experience - to walk on an active volcano which roars and rumbles from the bowels of the earth! The walking tour of the island takes around 2 hours with commentary that is both interesting and informative. We finish up at the old Sulphur Mine which was shut down after an eruption caused a massive landslide and claimed the lives of all the miners - the sole survivor was a cat. We return to PeeJay V via the inflatable boat, and enjoy a tasty boxed lunch before the anchor is raised. We circumnavigate the steaming island then our captain sets a course back towards Whakatane.